I'm a human trying to make it thru this world." This whole concept of "Be Still"? HARD WORK! I have dusted off my 50mm and am kinda enjoying getting reacquainted. However, I still can't imagine shooting in manual mode "on the fly" when I don't have the luxury of time to contemplate my settings. Perhaps...that will come with more practice. I'm skeptical. Altho I enjoy and admire the work of those who set up intricate Still Life scenes in their photography, I personally find my residence in the K-I-S-S zone. And yes, this is an anomaly as far as my life is concerned. Light, light....where for art thou light. I never seem to have enough. I like taking a photography class again. I need to work on the whole "be still" thang 'cause I'm already looking ahead to "what's next". 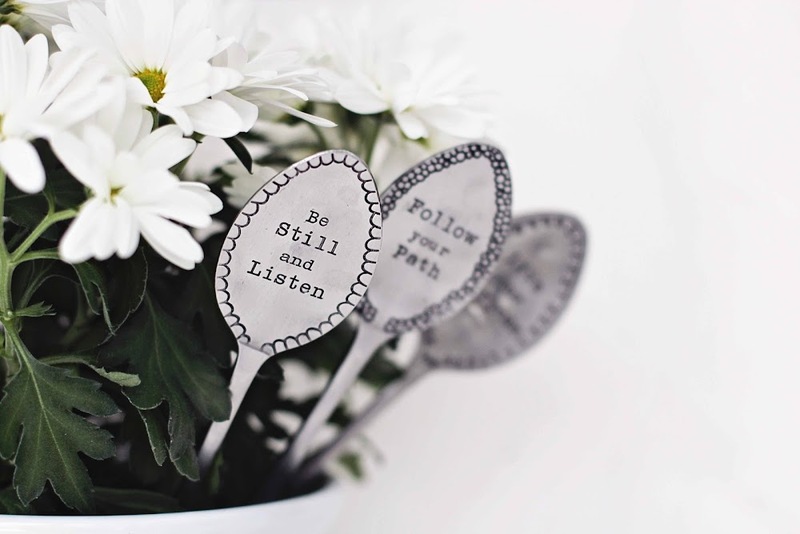 Be still and listen. Follow your path. Live your purpose. Trying to get into manual mode on that too! Gorgeous! It is SO hard to be still - you're giving me tons to think about on this! Lovely post Kathy........I think I will be still when I am dead. What I really need to do is be quiet.....hmmm. That's difficult too. MM photography is a bit of a challenge. I use it fairly often, but rely on AP for walking around shots. Less time to set things up and I'm more likely to end up with a usable photo in AP!! Bravo on your quest. Great quote. I love Ellen. Dusting off old lenses is fun. But I'm a creature of habit so I don't do it often. Beautiful shots Kathy. Your photography shines no matter what you're working on. 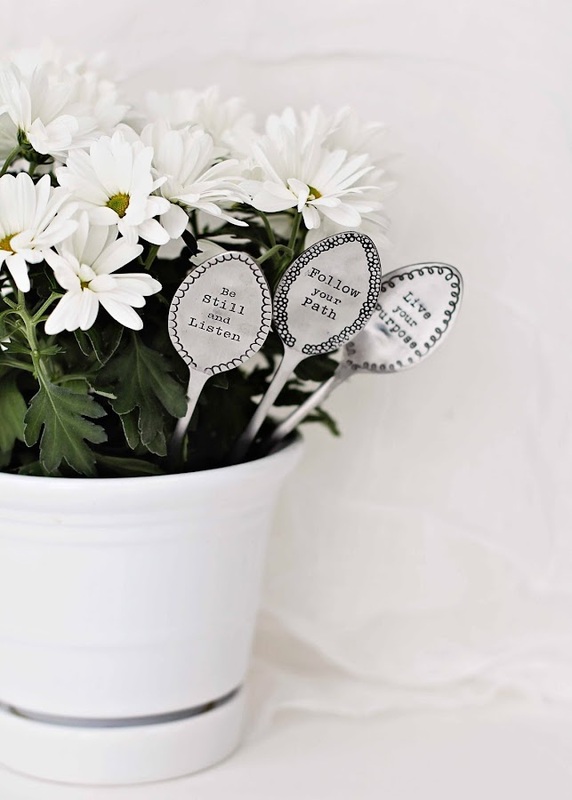 This pot of daisies and those spoons - have me swooning - how very gorgeous! Thanks for linking up today, Kathy! You made me smile. I love what you wrote and love you images. Just stunning.. Just Beautiful. Your photos are beautiful my friend. Those spoon are wonderful. I know all about the lack of light..And I'm in the sunshine state right now. YIKES..
Beautiful picture. I too rarely stray from the aperture and shutter priority safety zones when I don't have the time to muck about for at least five minutes with the manual settings. I will have to have a go at some 50mm still lifes myself. I have only really ever used it for taking portraits. Very under utilised, the poor thing. My 50mm has been sitting on my desk shelf for about a year--you've inspired me to dust it off. I have been shooting M on the fly, but it is hard and does not always give me the results I want. I find myself saying, "I'll fix it in LR." It is especially difficult when I am in a setting with a lot of people around. It's all a work in progress. I am all for K.I.S.S. I love what you did with the blur! Lovely and it seems that you did have enough light! Still and life and both together does not work for me - I lack the patience. You managed some wonderful pictures. Yes, it's so fun to try something different, whether it be a switch of a lens or subject matter, or purpose and yes to manual! I shoot manual 99.9% of the time even on the football field at night and when you start doing it all the time it really will become second nature. I just can't ever get the look I want with aperture, maybe I'm just a rebel? I'm in Kim's other BeStill class on week 30 something and I read the weekly emails and have done some of them, but like you I struggle with still life sometimes. It has to be personal for me....but just last week I did find some pretty awesome spoons at an antique store for just $1 each, score! Now, will I actually use them in a shot....only the shadow knows! lol Looks to me that you did find some great light, these are wonderful Kathy! Stillness is a practice… your photos show how dedicated you are to engaging with your subjects with this quality. Beautiful photos! Great message! and of course Ellen will always make you laugh and think! Stillness is hard, for sure. There has to be a good balance of stillness and activity. Too much stillness can bring those inner demons out to play for me. I will encourage you and say that eventually manual on the fly becomes easier. Of course, sometimes there is still not enough time to adjust but that mainly trips me with kids on the move. I'm proud of you moving to manual! I would love to be able to find a photography class to take. I'm kind of in the middle of nowhere. Maybe I need to look a bit deeper. Your photos are stunning. Shooting in manual mode takes me quite a bit of time, but you are inspiring me to practice more. being out of your comfort zone is a good place to be sometimes...lovely shots!! You take such gorgeous shots! I need to take time to be still, listen, and learn. Always shoot in auto. Wish I understood more! It's that needing to be still and learn thing. It's a hard thing to do. lol! Thanks for sharing with SYC.